What is behind it all?? 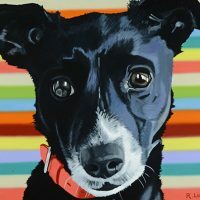 For my animal portraits, I’ve created a signature of bright colorful, graphic backgrounds that are fresh, contemporary and timeless. But I love to be challenged and to be directed in new directions and have done more traditional backgrounds, too. The rays of color came from a series of doll paintings I did – hyper-real, 3-D portraits against a flat background – the backgrounds gave them a visual power, sort of like German Expressionism or propaganda posters, lending the dolls an iconic power. When I started painting animals, I found that the backgrounds worked beautifully with them, too, surrounding them with a joyful burst of color and pushing the animal out of the canvas into our hearts and homes. When someone inquires about a portrait, I ask them to send me a good photo that they love of the subject. We discuss what size they want it to be. Then we discuss the background. Some people say “Do whatever you want,” some say “I like blue and green.” Some give me 3 or 4 examples of portraits that I have done that they like. One client sent me paint chips and I thought that was fantastic! Another sent me a fabric swatch, which provided the pattern for the background. There’s the old joke about folks who want art to match the couch and how insulting this can be to the artist. The thing is, I could care less about that. I’ve done my own thing and expressed myself for 30 years. When I’m painting a commission, I just want to please my client. 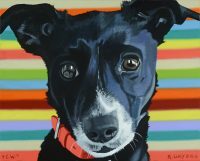 One client’s dog, FRANK, died soon after she had commissioned me to paint him. (I’m often painting memorials for animals that are no longer living.) She said that when she was burying Frank, she had a vision of him with an aura of yellow and orange radiating waves, and she would to like memorialize him that way. Frank was one of my favorites. 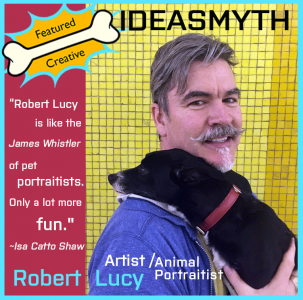 Posted in Branding Ideas, Dog & Pony Shows, Exhibit Ideas, Featured Creatives, Good Ideas, Inspiration and tagged art, dog & pony shows, Featured Creative, painting, pet portaits, Robert Lucy.